Great Britain's Jamie Murray and his Australian partner John Peers easily saw off Johan Brunstrom and Nicholas Monroe 6-2 6-3 in the first round of the Stockholm Open men's doubles. 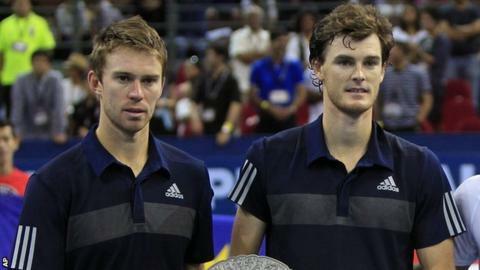 Murray and Peers breezed through the first set as their opponents double-faulted three times. Sweden's Brunstrom and American Monroe fared better in the second, but were beaten in under an hour. Grigor Dimitrov began the defence of his singles title with a win. The Bulgarian, who beat Russia's Teymuraz Gabashvili 7-5 7-6 (7-4), is one of Murray's brother Andy's main rivals in the race for the last few places at the ATP World Tour Finals. Andy Murray is playing in this week's Vienna Open, where he received a bye in the first round and will face Canada's Vasek Pospisil in round two. One of the Scot's other rivals for a Tour Finals place, Croatia's Marin Cilic, beat Evgeny Donskoy of Russia 6-3 3-6 6-3 in the second round of the Kremlin Cup in Moscow, after a first-round bye.